many implications, both in terms of attack and defence. The additional maneuverability of even the largest Star Trek ships renders Star Wars Bombers, with their powerful but unpiloted proton bombs, ineffective unless the Star Trek ship was first completely immobilized. There are examples of computer assisted attacks and defensive patterns, and even automated targeting, engagement and firing sequences. Weapon tracking, while rarely mentioned directly, it was apparent that weapons needed to track their targets. Manoeuvring the ship to aid in tracking and aligning targets for lock is another factor to consider in evasive manoeuvring. The increased speed and manoeuvrability allows them to dictate engagement range and time, which would play a huge role in combat, especially with comparative weapon ranges. If the enemy cannot hit you, they cannot damage you. The increased manoeuvrability allows them to shield weakened shields and damaged areas far easier than on more lumbering capital vessels, giving them a chance to reduce damage taken, as well as repair damaged sections and recharge shields. The increased manoeuvrability allows them to target enemy weak spots, such as areas with fewer weapons, weakened shields, already damaged sections, structural weak points, engines etc. with far more efficiency and accuracy to bring their weapons to bear and concentrate their firepower on such areas. The Federation ships' increased manoeuvrability allows them to evade more fire. As Rebels capital ships main weapons are ion cannons and turbolasers (which has previously been established as plasma based weapons), they would be slower than light, making them easier to evade. Though they have fewer weapon systems, Federation weapon systems have better arcs than their Rebel counterparts. The increased manoeuvrability allows them to bring more weapons to bear on a target as well as bring their strongest weapons, such as torpedoes, phaser lances and cannons, which might otherwise not have such great arc coverage, to bear more easily. 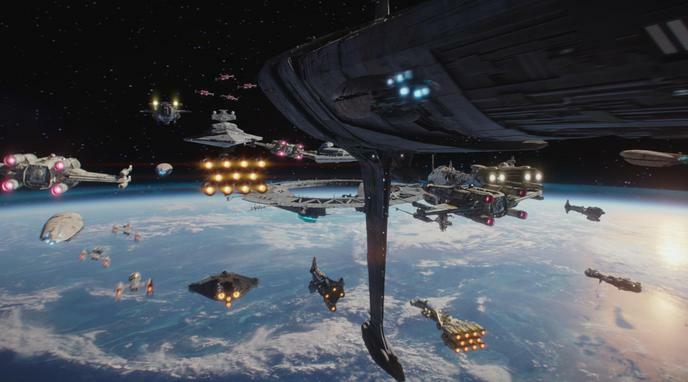 Even though Star Trek capital ships are much more maneuverable than Star Wars capital ships, the Rebels use mostly fighters to attack that are far more maneuverable than almost all Star Trek ships. This would negate much of Star Trek's advantage here. Rebel ships, in general, mount more weapons then Federation ships, covering more arcs, so their lack of manoeuvrability does not severely limit their firepower or ability to engage targets.